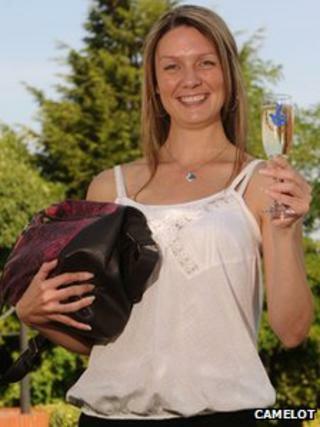 A London transport worker has won £1m after finding a lottery ticket which was in her handbag for three months. Jane O'Brien, 36, who works for Transport for London and lives in Ruislip, west London, decided her bag had become too heavy. She uncovered the EuroMillions ticket and checked it over breakfast. She said: "Every so often I get a Lucky Dip. It just went in the side of my bag. I didn't give it much more thought." The ticket matched the winning Millionaire Raffle selection from 10 May. Ms O'Brien, who works in the London Streets Traffic Control Centre which monitors traffic, said her managers were ""over the moon" for her. She told BBC London 94.9: "It's always been a dream to live next door to my mum so we're going to have a look, and wherever it's possible that's what we're going to do. "We'll take the middle fence down and have a massive garden."